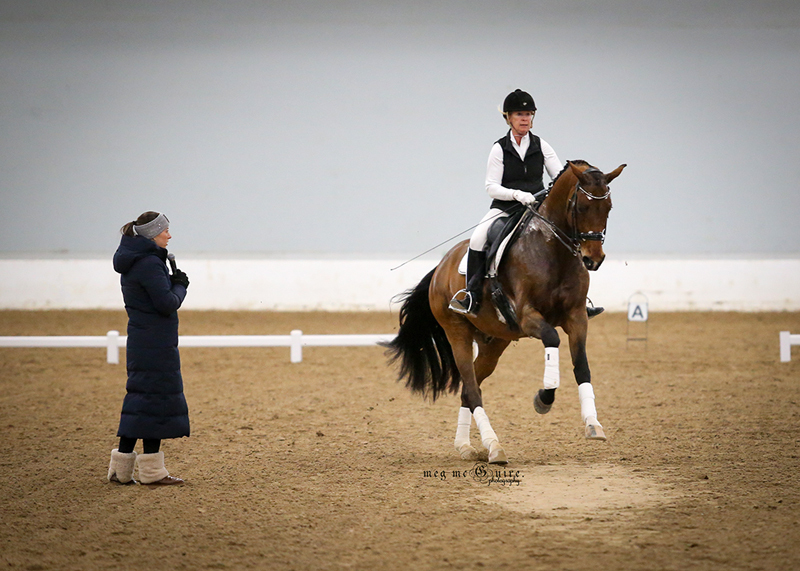 Repetition and mindful riding are some of the most important parts of producing a dressage horses, so on the first day of the Basic To Basics: A Masterclass with Charlotte Dujardin held Jan. 20-21 at the Kentucky Horse Park in Lexington, that’s exactly what Dujardin encouraged riders of all levels to focus on. 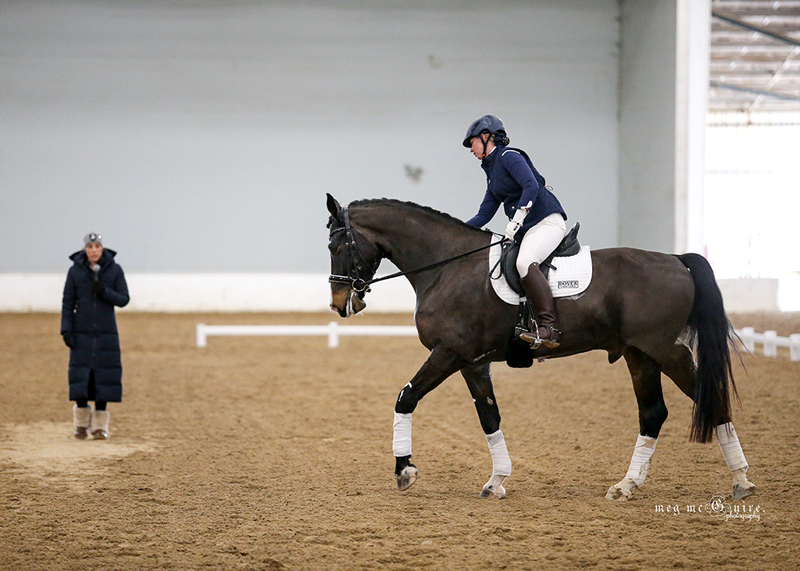 Dujardin began the event by outlining the characteristics she likes riders to look for in a prospective mount. It is not necessary to spend a lot of money on an inexperienced prospect, because Dujardin encourages riders to focus on areas they can improve, such as trot work. “For me, I love hot horses. The hotter and the crazier they are, the better,” she said. “Lazy horses make police horses. Not interested. When you get to top level Grand Prix and you have to ride three days, the last thing you want to be doing is kicking through the first test. Charlotte Dujardin encouraged riders like Susan L. Harris on Endavour Adventure to make sure every transition was a good one. If it was weak, she made them go back and repeat it. Photo by Meg McQuire Photography. In fact, Dujardin said people seem to get a little too enamored with a flashy walk or trot, but then fail to give the walk the attention it deserves in training. Dujardin encouraged riders of all levels to ride every transition with focus and intent, which she said many often neglect, particularly when they are coming down to a walk for a break or to finish a training session. Corners are another area Dujardin sees riders lose points unnecessarily. When coming across the diagonal for a new movement, a horse that is not properly balanced is destined to lose marks on the movement before it has actually begun. Charlotte Dujardin reminded riders like Elma Garcia and Wenesa that corners were the beginning of every movement, and that’s where points are gained and lost. Photo by Meg McQuire Photography. For rider Ashley Madison and training level mount Erdstern, Dujardin focused on trot-walk-trot transitions, designed to strengthen and prevent Erdstern dumping into the forehand during the downward transition. Later in the day more advanced riders worked on collecting and lengthening within a gait but universally struggled with keeping their horses consistent through the canter to walk transition. For sensitive horses like Forevermore that are still gaining experience, Dujardin said it’s important to consider how big a difference horses may feel between a small local show and a slightly busier event. It’s common for riders to forget how green a horse really is and come away from a bad test with a lot of frustration. She stressed the importance of remembering the whole process of getting on and off the truck, warming up, and performing can be a lot for sensitive horses until they’ve been through it many times over. Frustration only tends to worry the horse. For nervous young horses like Jennifer Strauss’ Forevermore, it’s important to bring them to shows not to compete but to give them good life experiences. Photo by Meg McQuire Photography. Dujardin also shared her thoughts on the whip. Earlier riders were permitted to keep their whips, but Grand Prix rider Mel Montagano surrendered hers to calm mount Police early on. Dujardin took the opportunity to share her thoughts about the limitations of whips. When Mel Mel Montagano surrendered her whip because Police was feeling excitable, Charlotte Dujardin used that opportunity to discuss the importance of using the whip as a tool, not as a “go” button. Photo by Meg McQuire Photography.